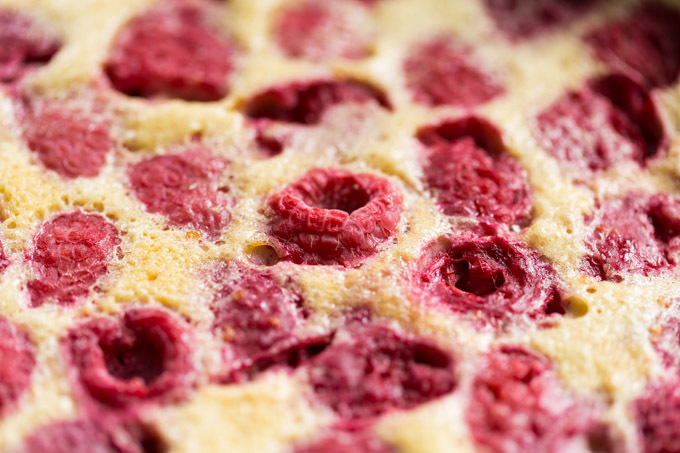 This raspberry clafoutis recipe was sponsored by Bob’s Red Mill. All opinions are my own. What is clafoutis? Clafoutis is a French dessert that consists of fruit baked in a thick custard. 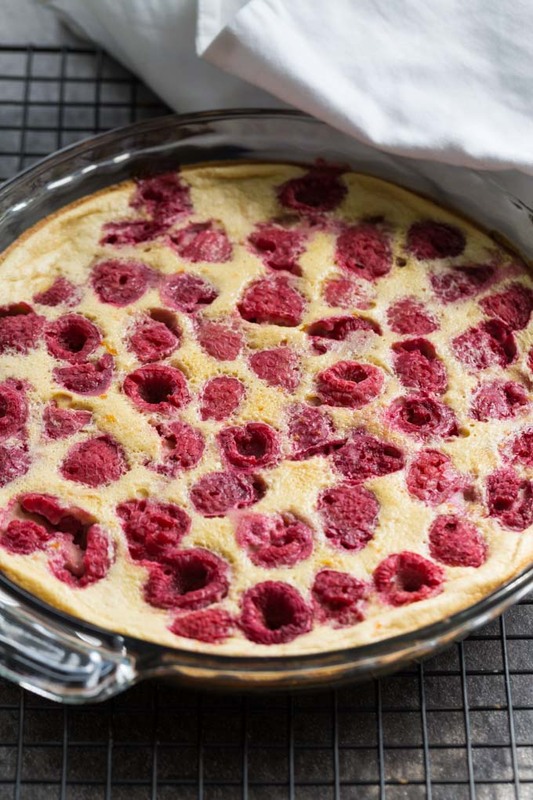 This beautiful raspberry clafoutis recipe is easy to make and gluten free. It is a truth universally acknowledged, that a single fruit possessed of a good flavor, must be in want of a custard. Custard, a simple mixture of milk and eggs in the right ratio, is the base for pudding, ice cream, flan, creme brulee, pots de creme, and many other recipes. The medieval French custard, clafoutis, is perhaps less known—but well worth getting to know. Clafoutis is pronounced clah-FOO-tee, with the emphasis on the second syllable and a silent “s” at the end. Sounds fancy, but it’s actually very easy to make, even for beginners! It uses a custard base thickened with flour, which makes it sturdier and more sliceable than your average custard dessert. 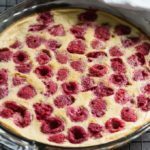 I use Bob’s Red Mill Gluten Free 1-to-1 Baking Flour to make this raspberry clafoutis gluten free. 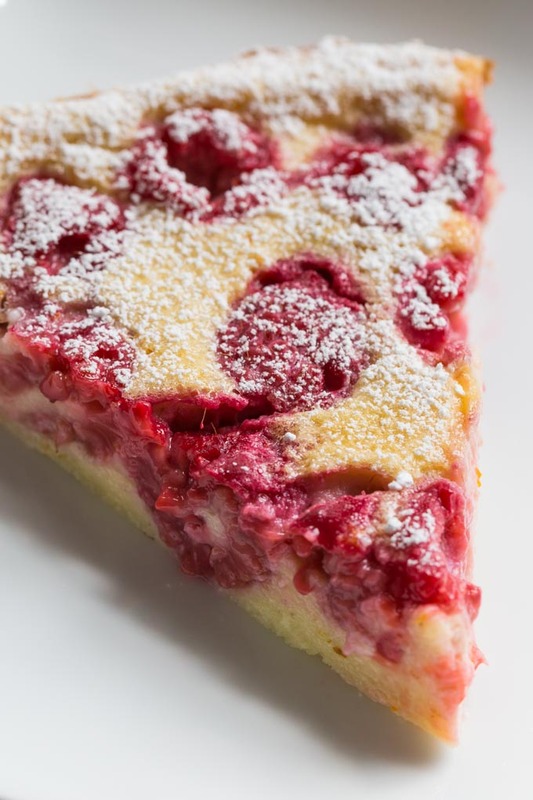 The earliest known recipes for clafoutis originated from the Limousin region of France and use black cherries, but you can swap in plenty of other fruits, like raspberries, plums, apples, or blackberries. Raspberries are my favorite because of their vivid color and for the tart contrast they provide to the sweet custard. 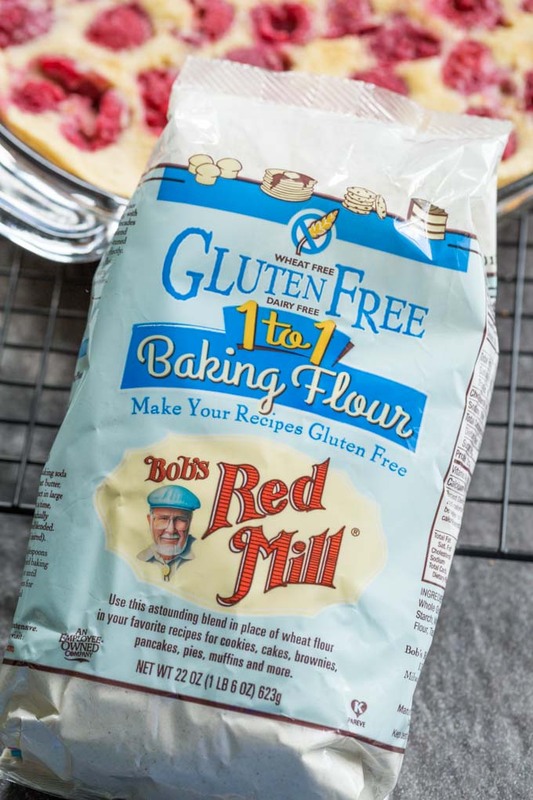 Be sure to check out Bob’s Red Mill Gluten Free 1-to-1 Baking Flour and some of my other favorite recipes, like sorghum cornbread and gluten free shortbread cookies! Clafoutis is a French dessert that consists of fruit baked in a thick custard. 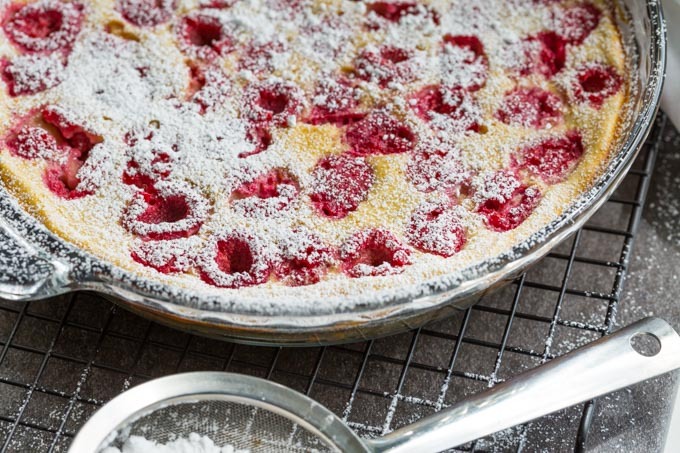 This beautiful raspberry clafoutis recipe is easy to make and gluten free. Preheat oven to 400 F. Butter a 9-inch pie pan to prevent sticking. Combine the flour, sugar, and salt in a mixing bowl. Whisk together. Add the eggs and whisk until smooth. Whisk in the vanilla and orange zest. Add the milk a little at a time, whisking after each addition until smooth. Carefully pour the liquid into the pie pan. Place the raspberries evenly throughout the liquid. Bake for 10 minutes at 400 F, then turn the temperature down to 350 F and continue baking for about 20 minutes, until the clafoutis is puffed up, the center is firm to the touch, and the outside edge has turned golden. Place the pie pan on a rack to cool. Cool until just slightly warm, or room temperature. Garnish with powdered sugar just before serving. 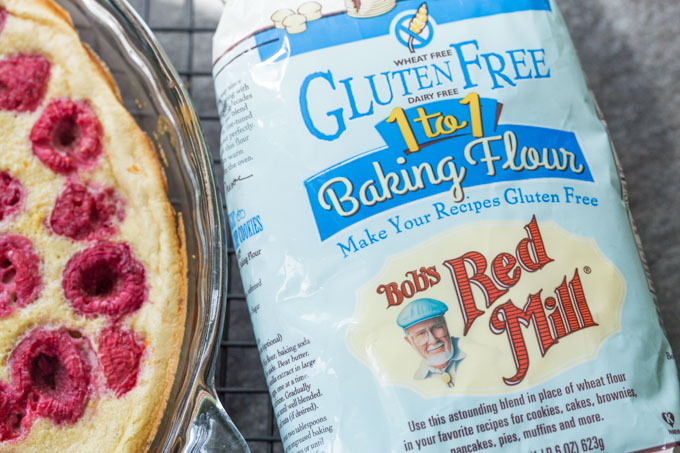 Note regarding flour substitutions: If you do not need the clafoutis to be gluten free, you can substitute Bob's Red Mill Unbleached White All Purpose Flour. Really great that you can do at home. I have my wife cook this on the next holiday. I love using raspberries in desserts. because they are not overly sweet and go well with a coffee or a glass of wine. I have been trying a lot of gluten free recipes, to catering to my moms diet. I hope she enjoy these. They look amazing. Raspberry is my favorite one. I am also in love with gluten free recipes. Thanks for sharing. I love a good gluten free recipe! This looks delicious! I know Bob’s Red Mill saved me when I first had to go gluten free. I love clafoutis! They are so easy to make and you need only few minutes to make them! I need to try your recipe! I love custard. And this will level up my skills in baking, hopefully. Thanks for this wonderful recipe. I love Bob’s Red Mill. They make some of the best flours available. I always turn to them when I’m looking to try and new recipe.